Buying a new computer these day more often than not also gets you a free printer. We already have a nice photo printer, so we typically just sell them on Craigslist or give them to one of the interns. Another reason why we don’t keep them is because most inexpensive printers do not use individual ink cartridges. When one ink color runs out, the entire cartridge must be replaced. We find the approach both expensive and wasteful, so we avoid using printers which require those all-in-one cartridges. Apparently we are not the only ones who felt that way and printer makers have adjusted their offerings. The nice thing about a WiFi-accessible printer is that anyone on the network can print to it without having to be physically be connected to it. It also means that the printer can be placed anywhere there is room or that is convenient. It was great to be able to choose a spot that was central for users instead of having to be tied to a computer. Printer makers know their profits are mostly from selling inks. Not all inks are the same. Branded replacement ink cartridges are typically the most expensive, but are usually the highest in quality. After-market inks may be cheaper, but they may fade, don’t give as many prints, or may not be as bright. However, if we are just printing hard copies of boarding passes, directions, or movie tickets…who cares? Still, when we do print color photos for framing, we want inks which will stay true and vivid…and OEM inks are best for those situations. Epson’s best ink for home printers is their DuraBrite line. They are fast drying (no smearing), fade-resistant (100+ years), and have integrated electronics in the cartridge to monitor ink levels. The containers have specially designed chambers to keep the flow even, something not found in the cheaper after-market cartridges. Setting up the Epson NX420 was a breeze. The directions in the built-in LCD panel on top walked us through both the initialization and WiFi setup. However, while we were able to get the printer to see the WiFi router, we could not get a proper IP address to be assigned to the printer. After a few tries, we decide to download the EpsonNet Config Utility so we could manually assign an address. That finally did the trick. We were able to see the printer from all of the laptops, but not from the iPhones or iPads. 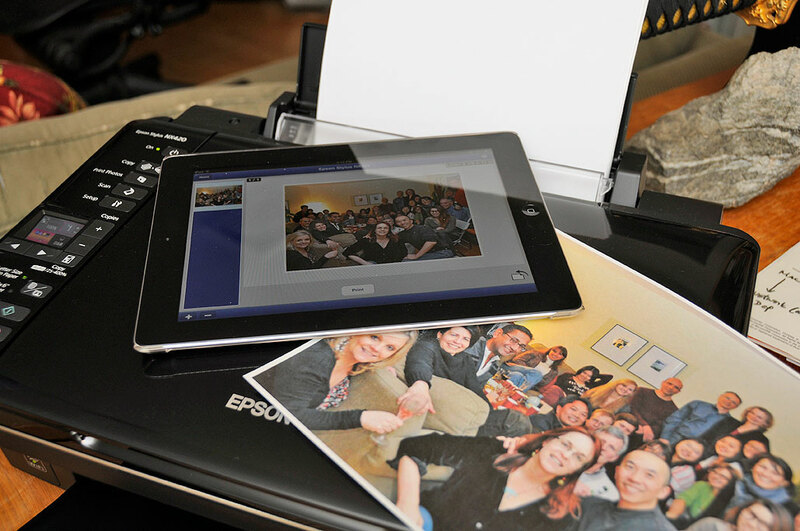 In order to be able to print to the Epson from iOS devices, we needed a free app called Epson iPrint. Once installed, AirPrinting from the iPads and iPhones worked flawlessly. 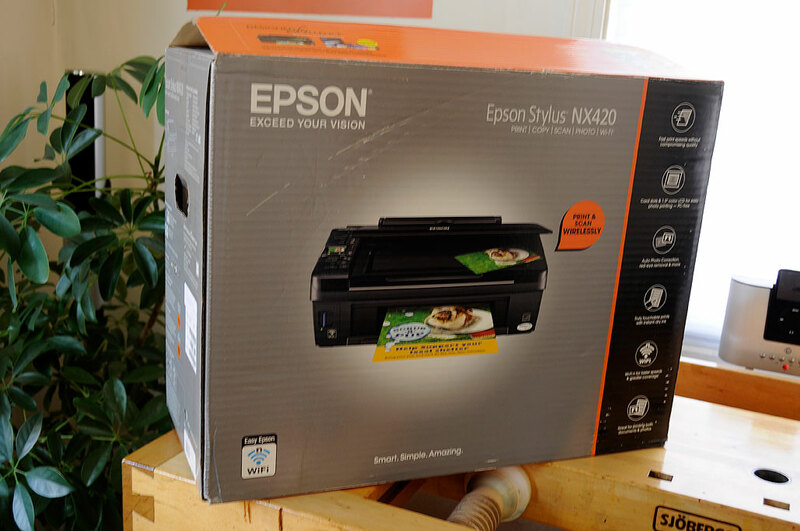 Now that we have had some experience with this Epson printer, we could not be any more impressed with how easy it is to use and with the quality of the prints we are getting from it. If you want to be able to print easily from your iOS devices, this WiFi printer is a high-quality, low-cost way to getting it done.